When we learned we were moving to Lagos for our first post we got a variety of mixed information. The State Department has a specific website where people who are leaving post can fill out surveys regarding quality of life, schools, housing, access to goods etc. in order to give oncoming people an idea of what to expect. Truthfully most of these reports were pretty dismal. Tied with the fact that the few people we knew in person who had served in Lagos had been posted here more than six years ago things didn’t look very promising. There was much concern about being able to get goods and foods locally. Well we need not be concerned, enter GAME. When I heard the name GAME for a store I instantly expected them to sell video games, which they do sell, but not exclusively. GAME is the Lagosian equivalent of Walmart. Yep, Walmart. They even carry Main Stay brand items. They also carry some Kirkland items mostly toilet paper and paper towels and almond milk. Weird right? 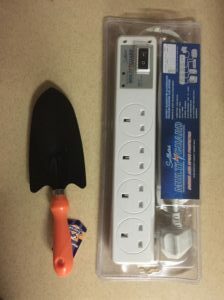 The point being, that it may not be exactly what you are looking for and may be of barely passable quality but you can get most of it at one store. More that 80% of sales in Lagos are done on the open market. Meaning one of two things, you go to one of the huge open air markets where you can buy just about anything or you know a guy who knows a guy who sells just about anything you can imagine. With the history of corruption in Nigeria most people have learned that they can’t count on much in life especially social services or the government. Most people work at least 3 jobs to meet the most basic of means. And I use the term jobs loosely. They don’t even call work a job here, almost everyone calls it a hustle. Because truthfully there are not that many “jobs” available. Even if you do have a job working as a cab driver you probably also do recycling pick up in the evenings and sell peanuts on the weekends. The official unemployment rate of Nigeria is 14.2%. Which doesn’t seem that terrible right? Well that is equivalent to 29 million people. This is just those that are not working at all. There are even more people who are underemployed and not working in their chosen field. It is even more dismal for young adults. According to the bureau, the age bracket represents the youth population in the country. It said that a breakdown into age groups showed that unemployment rate was highest for those within the ages of 15 to 24, while the underemployment rate for the same age group increased to 36.5 per cent in 4th quarter of 2016. In addition, the bureau stated that unemployment and underemployment were higher for women than men in the 4th quarter of 2016. 36.5% underemployment people+14.2% unemployment=50.7% of people who really are not working enough to matter!! continues in Sub-Saharan Africa. In 30 years time Nigeria is expected to be the 3rd most populous country in the world, with many of those people being under the age of 30 and with few employment opportunities. I have gotten off on a bit of a tangent but my point being that Nigerians are hard working and willing to take it upon themselves to try to make a buck. Thus most commerce actually occurs on the streets and not in a store. Us Americans (and British and Lebanese) are much more accustomed to just going to a store and finding what we need on a shelf, with a price tag and no accompanying haggle over cost. So GAME exists for us. You really can find just about anything there and they even have labels and packaging. People go to GAME dressed to the nines, truthfully most Nigerians are well dressed at all times. Amazing custom tailored dresses and suits with an abundance of luxurious local fabric and sequins. I am always, and I mean always under dressed. You can always pick out the Americans. So here I am shopping at GAME in my capris and t-shirt feeling like I missed the dress code and I get the privilege of explaining what a shelfie is to Dannica. At least it is what I have always considered a shelfie. To me a shelfie is when someone takes a picture of themselves shopping or of items on a shelf at a store with the real intention of capturing the person or object in the back ground. People do this all the time with celebrities or their crushes because it would be uncool to just snap a picture or selfie with them. Evidently I am the only person with this definition of a shelfie. According to Urban Dictionary there are a dozen different definitions of shelfie but the most common is taking a selfie while using the toilet. That is a thing?? Well regardless, for the rest of the post consider my definition correct. There was a group of young adult men who were browsing and messing around snapping pictures. They seemed to be having a good time when I noticed they were totally taking shelfies with Dannica. A dude lifting a weight from a shelf, my tall and beautiful daughter in the background, just a couple of goofy teens wanting to snap a picture of a cute girl. I did find it necessary to explain to Dannica what they were doing though and leave it to her to decide how to handle the situation. 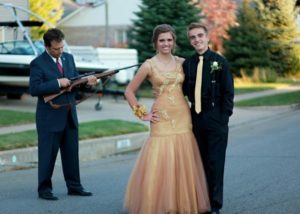 You know all of those memes or pictures of young women going to Prom and their fathers are seen in the back ground pointing a gun at their date? 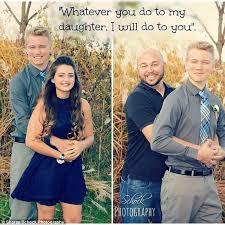 Yeah those pictures that are supposed to be funny and get the point across that they boy shouldn’t lay a finger on their daughter. They are completely demeaning to both young men and young women. First of all why assume all men and grabby, lustful, sleazes that can’t contain themselves or ask for consent. Second, why is it the fathers decision what the daughter does with her body? If we want young women to be strong enough to say no when there is an unwanted sexual advance we need them to feel like they are able to make their own sexual choices, choices that might include some sexual actions with their chosen partner. These photos and the accompanying thought process is just so backwards to me. So, in my belief that my young adult children are responsible for their own sexual choices, I pointed out to Dannica what was happening and asked her if she wanted to do anything about it, if she wanted to ignore it, or if she wanted help from me. She turned, glared at the boys and rolled her eyes, the boys broke down in a fit of giggles and that was the end of it and now Dannica knows to be aware of shelfies, because 90% of personal protection is being aware of your surroundings. So there you go some random ramblings including the excitement of Lagosian Walmart, Nigerian unemployment, what is a shelfie, and females owning their own sexuality. Happy Monday! “The State Department has a specific website where people who are leaving post can fill out surveys regarding quality of life, schools, housing, access to goods etc. in order to give oncoming people an idea of what to expect. Truthfully most of these reports were pretty dismal.” – I’ve read these same reports. What are your impressions having been there for several months? Were those reports accurate, or have things changed for the better? Thanks! There are hard things about living in Lagos that is for sure, that said the post reports set us up for a negative experience and in our 6 months here it has been anything but that. #1 it depends on the type of people at post. Most people here now are flexible, good natured, and optimistic. It helps so much. People have been open and kind. They are a pretty tight community. That said I guess the last group wasn’t that way and morale suffered. #2 Lagos is a different city from one year to the next. People who have been here for 4 years can’t emphasize enough how different it is from arrival. I would ignore any post report older than 2014 for sure. The information is just no longer valid. Too much change. We have a dozen European style grocery stores to shop from and you can get just about any food if you are willing to pay for it and if not you get consumables and Amazon. There are three malls, an IMAX movie theater, trampoline park, beach, yoga, art classes and museums, lots of live music options, the yacht club. There are probably more than 30 restaurants that cater to expats. You can get Mexican, sushi, Thai, pastries galore. There is even a Hard Rock Cafe and Dominos delivers. Most places deliver. #3 It is Africa you have to be flexible. Things wear out faster than normal. It is harder to replace things when they do. There is trash on the streets. Huge potholes and flooding. It can be loud and dirty. Traffic can be bad but the consulate goes through great measures to make it less of an impact on its employees. You get to ride a boat to work! Crappy Harmattan air in a few winter months. Power outages multiple times a day, usually a 1 minute delay then the generator kicks in.Internet can be intermittent but 70% of the time it works and we can stream movies etc. So as I said we were expecting the worst after reading those reports and we have overall been very happy with our experience so far. I mean if we wanted to live in the US we wouldn’t have taken this job, right!